Cook Islands has embarked on its OLPC adventure with the deployment in early February of 72 XO laptops to children on the remote island of Mitiaro. The laptops are being deployed by the Cook Islands Ministry of Eduction (MOE) and the Information and Communication Technology (ICT) division of the Office of the Prime Minister. In fact Prime Minister Jim Marurai has been personally instrumental in driving the project forward. 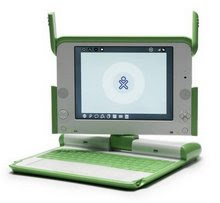 The laptops are part of a tranche of 5000 donated to the Pacific by the OLPC Foundation, Cambridge, distributed with the technical assistance of the Secretariat of the Pacific Community. Cooks' Secretary of Education, Sharyn Paio, told the Cook Islands News the government is "pleased that, at long last, these laptops will be put to use and trust that the children and teachers will find them useful." We will soon share stories, photos and videos from Mitiaro.